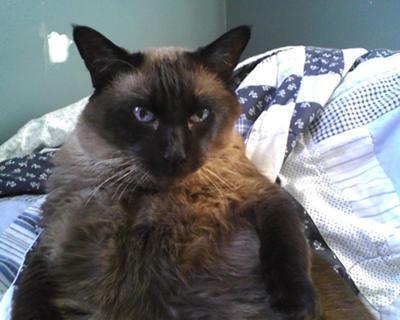 My 14 year old Siamese cat wakes me up in the middle of the night to feed him. When I'm sleeping in my bed, he jumps on me and meows. I have him trained to recognize the phrase "beef" - every time I say it he whines like a little child till he gets it. Also, when I stop petting him he gets mad and swats, and lightly gnaws on my hand. How did you train him? My boy Hiro whines every single night. How do I get him to relax at night? I'm exhausted. Thanks so much for your photo and story. My Siamese also wakes me up to feed him, generally by patting my face until I get up. He has learned though not to do it in the middle of the night, but is good enough to wait until around 7 a.m.
Siamese cats are masters at getting their owners trained to be their slaves!